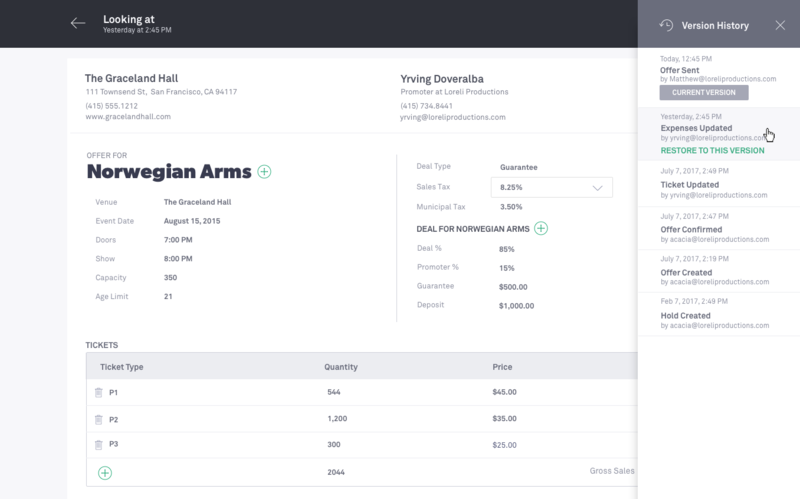 Ticketfly Promoter is the world’s first end-to-end product for calendar management, offer creation, and settlement. The goal is to simplify the artist booking routine. 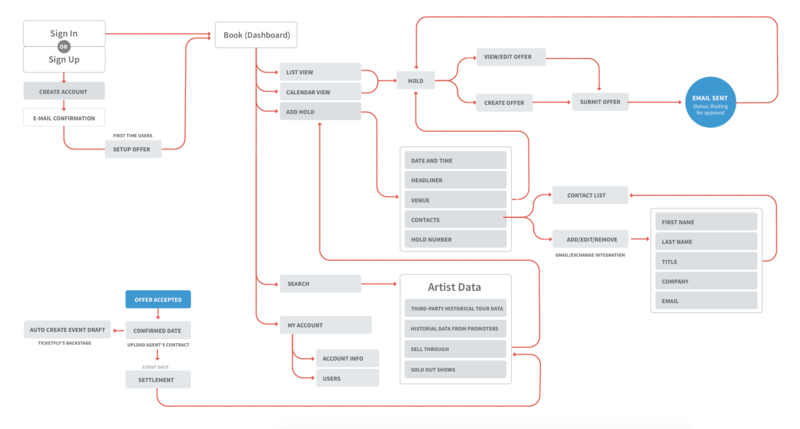 A series of tools where you can manage artist holds, draft offers, confirm shows, and settle events. All in one place. After conducting a lot of user research we found out that promoters and agents were using multiple tools to get their job done. A lot of tools: calendars, email, spreadsheets, post-it notes, whiteboards, event management tools, and their phones. There's a lot of friction and they all have different approaches. We needed to identify patterns to create an industry standard that could work for everyone. Promoters rely mainly in personal relationships. They either work with assistants to help them keep track of possible events or by themselves to draft offers. We learned that the solution shouldn't get on their way but help them streamline their workflow and make the artist booking decision easier and efficient, while giving them absolute control. 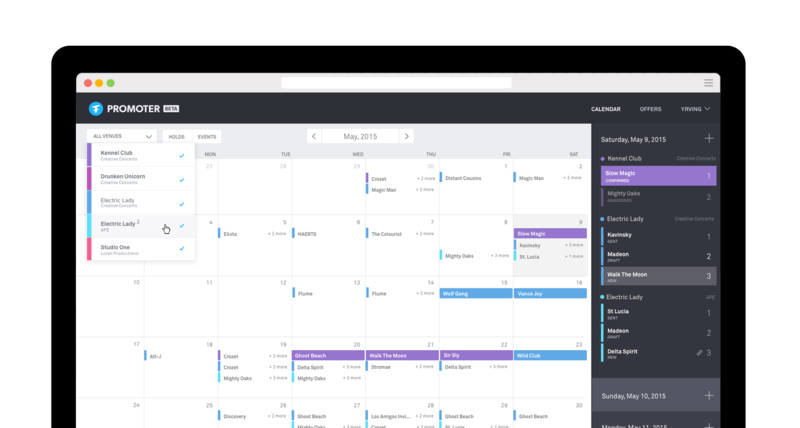 The main interface is a booking calendar designed to support promoters with a single or multiple venues. This is where color comes in handy. 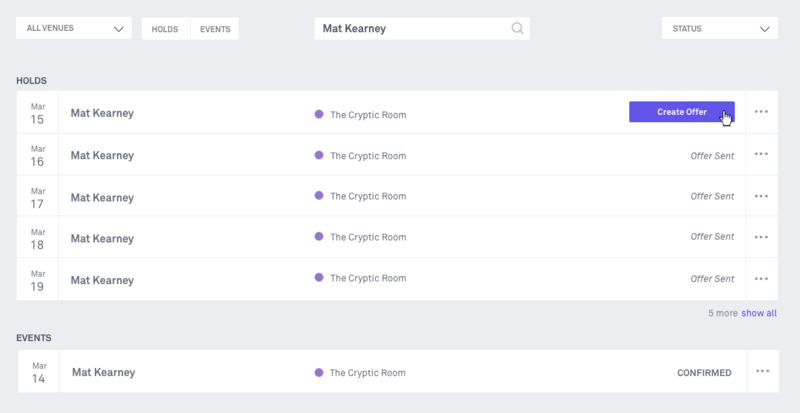 We use a unique color per venue, allowing the user to immeditately identify the venue and the difference between a hold and a confirmed show. 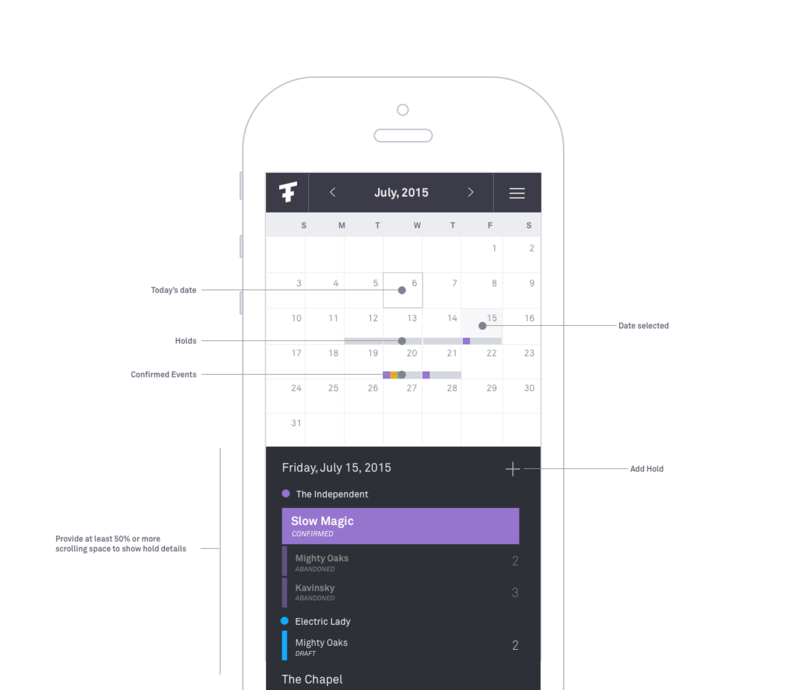 One of the design challenges was to find a way to display both: a month overview but also day details. Give the user the ability to scan through the month but dig deeper into a day if needed. 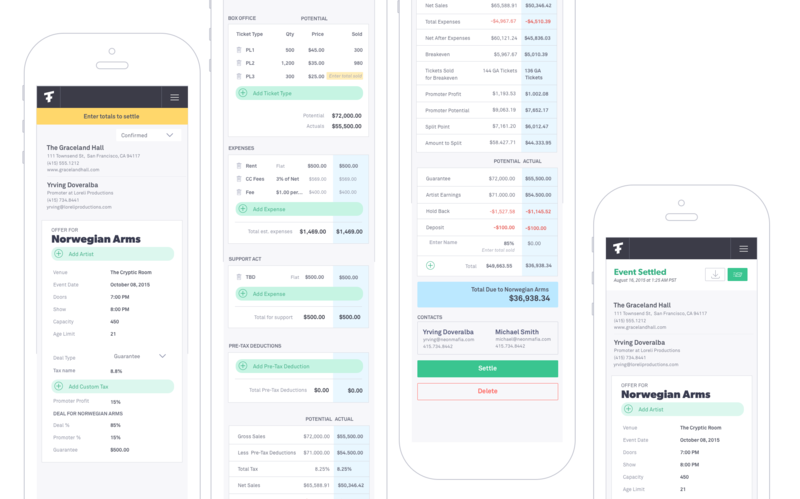 The right panel allow us to see day details with an infinite scroll and the flexbility to display a lot of items vertically. 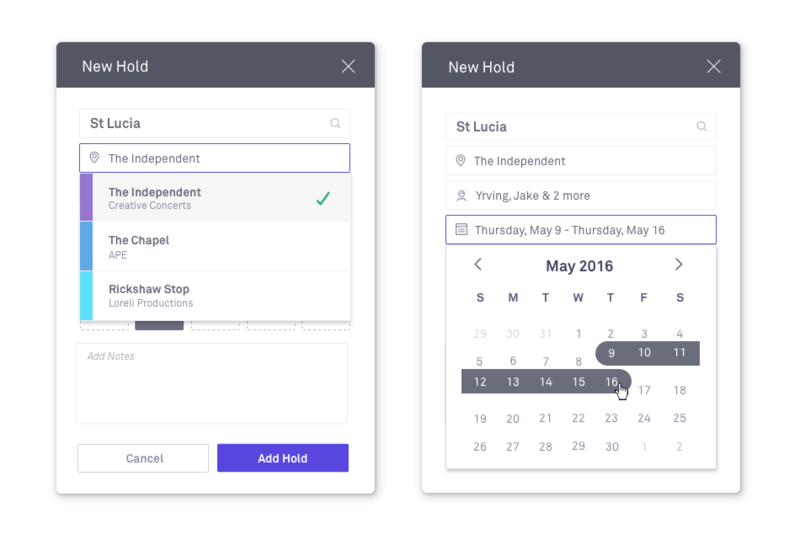 Adding or editing a hold is easy and done without leaving the main interface. One of the most complex parts of this product was the offer tool. We conducted sessions with promoters to understand how they get their job done and what's absolutely essential to make a deal with an artist. 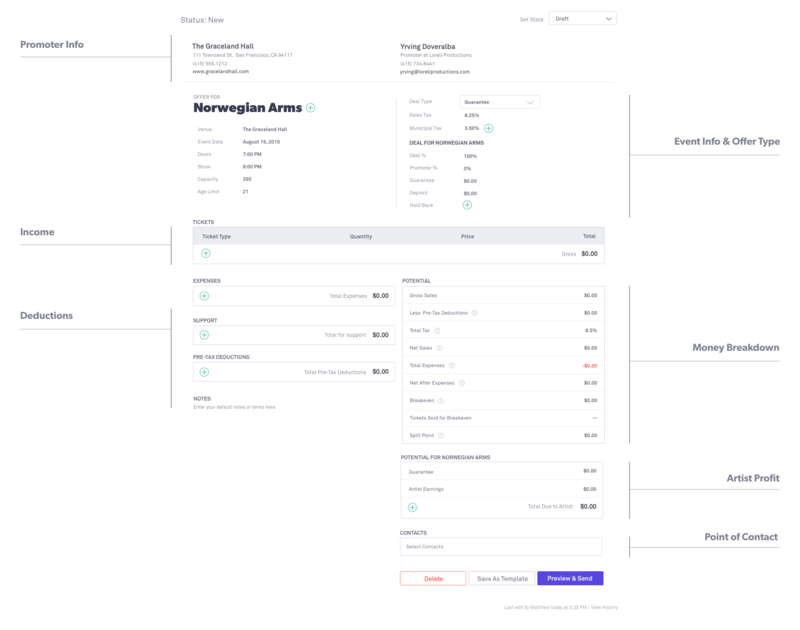 The result was a customizable offer sheet—designed for Promoters—that allows them to create their deal type once and save it as a template. This allows them to create their offers with a single click. No more spreadsheets. Promoters and agents are always on the go, so it was important to have a mobile view. 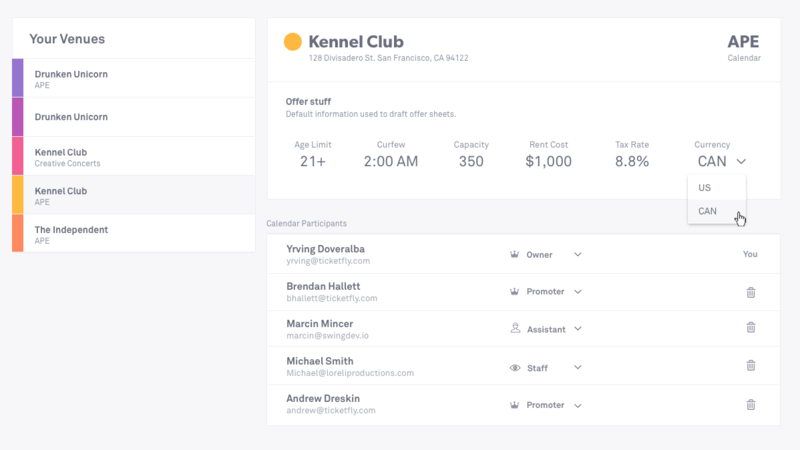 The modular design system on the offer tool allowed us to stack the components of it, delivering a responsive version of the offer sheet on the Promoter and Agent's hands. Ticketfly Promoter is available to Ticketfly partners.